Being the parents of a child murdered by a proud and pleased woman who doesn't stop boasting about what she did was never going to be easy. Tamimi walked free, along with 1,026 other Arab terrorists - most of them killers - in the catastrophic deal Israel made with the Hamas terrorists to secure the freedom of an Israeli hostage, Gilad Shalit, in October 2011. She has been living free-as-a-bird in Jordan, not under cover, not in hiding, ever since. A few days after the announcement, Jordan announced that its courts had ruled that the 22 year old treaty was, under Jordanian law, of no legal effect. Consequently, Jordan said, it would not be handing Tamimi over to the Americans. It was announced some months later, on January 30, 2018, that a $5 million reward is now offered by the US State Department for information leading to Tamimi's arrest and conviction. The reward is nominally still in effect. But we have come to realize there are serious, unpublicized and troubling problems connected with how the reward actually works in Tamimi's case. All our efforts (and we have tried hard) to get answers to our questions from the Rewards for Justice unit at the State Department and from other State Department officials have been unsuccessful. We'll come back to that later. Between February 2012 and September 2016, Ahlam Tamimi hosted her own television program called “نسيم الأحرار” - “Nassem al-Ahrar”, or in English: “Breezes of the Free”. This was produced and distributed by Alquds TV, one of Hamas' two global satellite channels, from a studio in Amman, Jordan. It is inconceivable the Hashemite government didn't know and couldn't have stopped it. 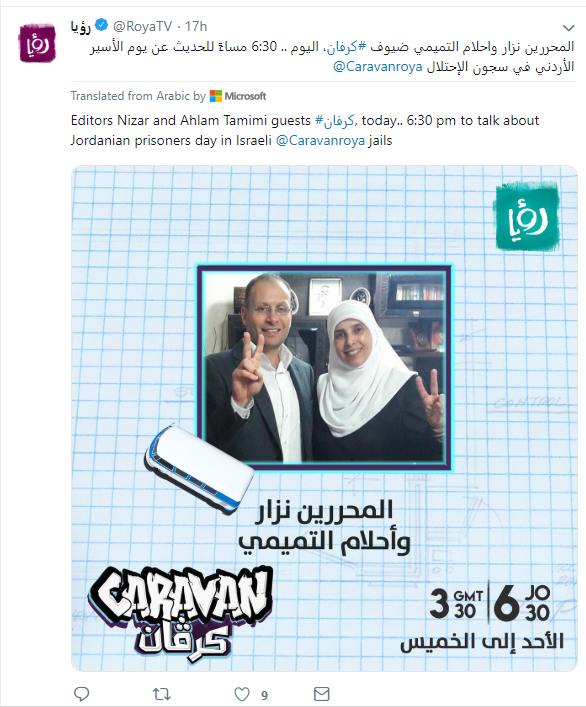 As a practical matter, the Tamimi show served as an Islamist-inflected voice for and by Palestinian terrorists behind Israeli bars - an invaluable, strategically important two-way channel of communication, encouragement and incitement to terror. Tamimi, already a celebrity by that time across large parts of the Arab world as a result of her frequent appearances in the news and in front of live audiences, leveraged it as a platform to further cement her status among Arab-speaking audiences wherever the Alquds TV content can be seen - literally everywhere. In addition to being broadcast over the air, the weekly program was distributed to global audiences via dozens, perhaps hundreds, of little-known websites specializing in streaming video content - meaning a viewer need only have a smartphone or laptop with Internet connection; no TV, no satellite dish, no impediment to achieving the widest imaginable influence. She dropped out of the program without warning in September 2016. As we learned much later, she was very briefly taken into police custody in Jordan on an Interpol warrant (never reported outside the Arab world as far as we know) at that time. She subsequently lowered her profile (we explained the circumstances here) for a time as the efforts to have her extradited and brought to trial in the US worked their way through Jordan's channels of power. 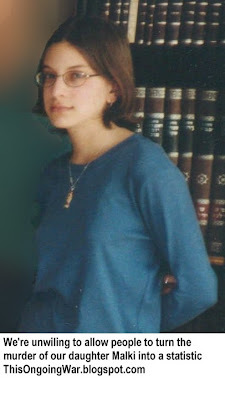 Throughout her years back in her homeland Jordan, she has appeared both widely and often in the darker and more extreme corners of the Arabic media, always encouraging terrorism, always basking the glory of having defeated the Zionists by being released back into freedom despite the many Jews she murdered. Needless to say, she has never shown the slightest remorse for her savagery. Followers of Frimet Roth's blog already learned exactly a month ago ["Our daughter's murderer - live on Jordanian TV yesterday"] that Ahlam Tamimi, seated beside her husband, recently took a central role in a totally-mainstream Jordanian TV program. Caravan is a weekly TV show on Jordan’s privately-owned Ro'ya TV channel, evidently the most watched of Jordan’s TV channels. Caravan doesn't appear to have anything political to say. It aims explicitly at a young audience - not children - and gives the impression of trying hard to seem hip in a vaguely Western way. In its October 23, 2018 edition, the show's attention was entirely given over to Ahlam and Nizar Tamimi, Jordan's best-known husband-and-wife team of convicted, unrepentant Palestinian Arab murderers. And as becomes painfully clear, a pair of well-loved Jordanian heroes whom 'everyone' knows and respects. From our friend's report, it appears no mention was made in the entire hour-long program of the atrocities carried out by the Tamimi couple. 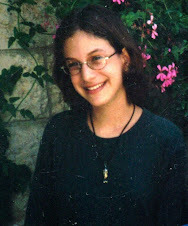 No indication of the acts of savagery that earned them their conviction before Israeli courts. Not a word about Ahlam Tamimi's constant incitement to terrorism. No hint of her repeated public endorsement of how murdering Israeli children serves the interests of the Palestinian Arab resistance. There was also no reference to how she claims now to be innocent of all the charges brought against her by the Department of Justice; or of how she believes the conflict between the Palestinian Arabs and the Jews, far from being about occupied territories and national self-determination is actually a "religious struggle". Nizar Tamimi says they met after he was already imprisoned in 1993. [Imprisoned? Why? Viewers are left to assume it may have been for a traffic offence; there's no hint given of the brutal murder of an Israeli man of which he and several other Tamimi cousins were convicted in 1993]. Ahlam, he says, was a Jordanian citizen who came to study in Palestine. At that time, visits by relatives, both second and third degree, to the prison were permitted. They were related (he doesn't say how - in reality they are related in several different ways since the Tamimis are deeply involved in marrying within their clan) and she came to visit him. They stayed in touch. Nizar Tamimi: [03:54] "Then in 2001, Ahlam was arrested because of her involvement in the struggle and jihad activity [Notice that the fifteen people she murdered, the sixteenth person who remains unconscious to this day - these are not important enough to be mentioned even once in this program] In prison, we were in contact... It was difficult to be in contact, it was not permitted, and the security conditions became more stringent after the outbreak of the Al-Aqsa Intifada. Praise to Allah, in 2005 we managed to make a marriage pact while we were in prison... Praise God, we are now living well." 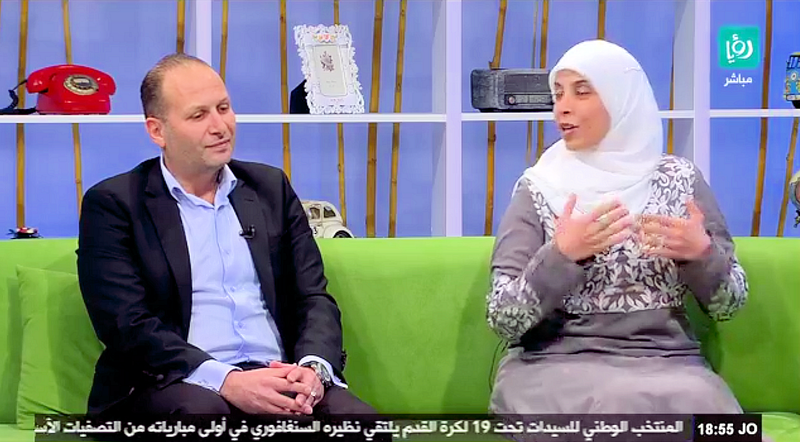 Presenter asks Ahlam Tamimi how she felt when sentenced to multiple terms of life imprisonment. Ahlam Tamimi: "...A life sentence is not a logical thing. But the security establishment of the Zionists aims to compare [Translator: seeks to balance] the state of fear generated by the Palestinians via the struggle activities [Translator: operations] that we have been waging over the years – with life imprisonment. They consider that every dead Israeli should be answered with a life imprisonment sentence and in this way placate the anger of the Zionist families of those killed in the various operations... Nizar was arrested in 1993 and remained in prison for about 20 years [sic – in reality 18 years]. I was arrested in 2001 and I remained ten and a half years [sic – just barely ten years] in prison. Nizar got a life sentence, I received 16 life sentences! And that’s to be expected. When we choose to go on the path of struggle, we or any Palestinian, there are known scenarios [ahead]. Either you are arrested or you die as a shahid [martyr] or you get injured or you become a fugitive. When we choose to go on that path, we are ready for any possible scenario..."
Presenter: [15:26] "This is admirable! You, the people of the struggle, elevate the name of Jordan!" of the 70 Israelis his terrorist bombs blew to pieces. Video grab (on the right): On display in the art exhibition, a portrait of Kuwaiti mass murderer Abdullah Barghouti, the Hamas master bomb-maker. His worried mother, speaking with considerable emotion, is interviewed live on the program and with maximum sympathy. She says she is optimistic he will be out of prison soon. Presenter: [20:23] Were you aware of [the Shalit deal] while you were still in prison? 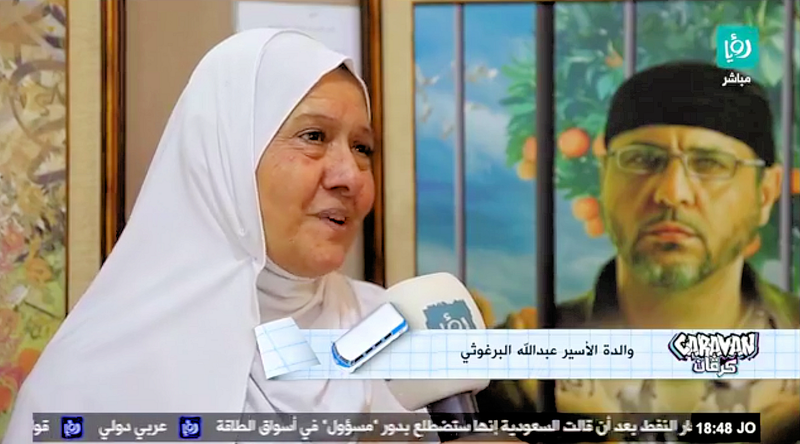 Ahlam relates that the Shalit Deal had been under discussion from the time Shalit was abducted in 2006 until the mass prisoner release in 2011. She notes that in this transaction, out of thousands of prisoners, only 1,450 prisoners were released [sic – in fact the number is 1,027]. And the others expected their names to be included in the list but unfortunately they did not leave. But, thank God, there is always hope, and the proof is that there will be another deal, inshallah. And with the help of Allah, all prisons will be emptied. A member of the audience congratulates the program’s guests and asks whether the Jordanian government stays on top of the issue of Jordanian prisoners [in Israeli prisons]. Ahlam Tamimi answers that the embassy [in Israel] does take an interest in the prisoners, but it does so only to a minor degree, and it is to be hoped that this degree of interest [by Jordan] will grow. Presenter asks if they feel the support of the [Arab] street for them and for the Palestinian cause. Did they feel this support when they were in prison? Nizar Tamimi answers that there is radio and television in prison. This has happened thanks to the efforts of the prisoners, their protests and strikes. There are programs focusing on peace demands and so on for the prisoners. These strengthen and encourage the prisoners. Presenter asks Ahlam Tamimi what her aspirations in life are or were. The enemy's media [Israel of course] disseminates the message that those who join the Palestinian resistance lack aspiration, lack a love of life apart from the desire to succeed in injuring their enemies. Thus we hope there will be more activities by young people to support the issue of Jordanian prisoners and Palestinian prisoners. So that we can direct our words towards the Zionist Entity [Israel of course] saying: "No! To the matter of the prisoners there are consequences not only within Palestine but also extending out to Jordan, to Tunisia, to the entire Arab world. When Ahlam Tamimi urges "more such activity", it needs to be absolutely clear that she is not referring to knitting classes. It's evident the Tamimis, who in April 2017 began maintaining a relatively low profile, have now been given a signal to emerge and to take their place in Jordan's public spaces. At the same time, they have taken care, or been carefully instructed, not to sound violent or directly threatening, though the female clearly does engage in incitement to terror and violence directed at the young audience that Caravan seeks. It's worth underscoring the central point here: not a single word of the entire program addresses why the Tamimis were in prison, or the length of their sentences (multiple life terms). This is not “reality” programming but rather soft-focus, inspirational television, in some ways like certain religion-centric shows familiar to us in the West. But the people getting the adulation. the respect and the platform are not mere eccentrics or Bible thumpers. They're coldly enthusiastic murderers. Utterly unrepentant and embraced as role-models and heroes by mainstream Jordanians - and their mass media - because of that. The full video of the Jordanian tribute to the Tamimis which originally went to air on October 23, 2018 is online here. As far as we can tell, no one in the mainstream media has given this any attention at all.